I’m back in Seattle after a pretty quick and fast receding week in New York debuting Orange Twist cards at the 2012 National Stationery Show. Ja from Ilee Papergoods and I left together from Seattle on a red-eye Jet Blue flight Thursday, May 17th and got in to JFK around 6am. We snagged a breakfast sandwich at my bidding and scarfed those down before arriving at the empty, fairly deserted luggage carousel a half hour later. In my blurry brain I figured the luggage was just slow in coming, but after asking an attendant, found out our bags had already arrived and been transferred to the baggage claim office. Oops. I guess I haven’t done much air travel lately. We hustled over to the office where we located our large suitcases and trundled them over to the cab stand. We headed into the city during rush hour traffic and got to the Jacob Javits Convention Center on the west side of Manhattan around 7:45 am. Doors opened for set up at 8 and we headed over to our address for the next six days–booth 1175. Our pallet had arrived in good condition so the first order of the day was unloading it and starting to put up our walls. When loading the pallet we’d envisioned starting at the aisle and building to the corner, but Ja pointed out that having the walls flush at the corner was important and we should start there and build out in case measurements with the booth and/or the actual wall panels weren’t quite perfect. With that wisdom we started in the corner of our 6 foot wall and worked toward the aisles. Only four more feet to go! We were pretty much alone in our block of the aisle and worked as efficiently as possible given our jet lag, the early morning, and the now backwards way that the panels were loaded on the pallet. Putting up the walls took about 2.75 hours and after they were up and sufficiently braced, Ja and I headed down to get our first, and much needed coffee of the day. I’m pretty sure that at one point while I was bracing the back of the panels, Ja was leaning against the front and falling asleep. Once we had coffee and Sarah from Tutta Lou Press arrived, we decided to lay down the floor. Sarah had seen some great photos of brightly colored tape floors and we borrowed the idea by laying down 2 inch strips of color. Let’s just say that laying that 6×20 foot floor took a loooong time with two people working in tandem. In fact, by 8 pm that night we’d discovered that we had 36 square feet of floor still to cover and maybe 12 square feet of tape left. Ooops. Chalk that up to my bad calculations. Luckily Ja and Sarah were too tired to brow beat me for my mistake and instead, that night at our hotel, strategized about what to do. After sleeping like a logs, and filling ourselves with a hearty breakfast, Ja and I went to a hardware store while Sarah finished up some paperwork. After a bit of explaining what we were looking for, we miraculously located five of our six colors of our tape! Instead of being 2 inches wide they were only .7 inches wide, but we were ecstatic. We bought the needed rolls and headed over to Javits where Ja and I finished up the last chunk of flooring and worked on our individual displays. That second day setting up went pretty smoothly with all of our neighbors filtering in to set up also. Despite glue dot issues on Sarah’s end, spilled paint, a crooked calendar, and being reprimanded by the Javits electricians, our set up went really quite smoothly and looked great by the end of the day. Ja and I finished around 6 pm and headed to buy some kind of broom with which to sweep our masterpiece in the morning while Sarah hung around another couple hours in order to finish up her display. That night we ate out in our ‘hood, and worked on last minute line sheets and paperwork to print the morning of the show, and then conked out around midnight. I’m down to the wire, but things are looking pretty good. The feeling of panic has pretty much left and I’m just hammering out what needs to get done. We shipped out our freight last Monday and that really made me feel much lighter and focused. My catalog has gone to the printer’s and Mr. Mate and I have started to revise the website. There will be lots of updates, but most will be on a piece by piece roll out since time is a limited resource at this point. However, I am super excited about my new logo! I revised my todo list to include actual days that I’ll need to print and it very well looks like I’ll be printing until the 16th–the day before I leave. But the actual printing is going well and if I can keep up these 10-11 hours days–I’ll be golden. I’ll be posting Facebook during the show, so stop http://www.facebook.com/OrangeTwist by for update. I’m thrilled to unveil Orange Twist’s new logo. Created my super talented friend and designer Anna Goldstein, the new logo captures the clean, playful nature of Orange Twist goods. We’re redoing everything from the logo to the packaging of our products and I’m excited that the printed side of the re-branding is coming together in time for the National Stationery Show. Stay tuned for updates and let me know what you think! Moderate panic has set in. I’ve got a list of things to do that rolls out the studio door, down the stairs and into our spare bedroom which is now a staging area for everything that comes in and out of the house related to the Stationery Show. To say I’m stressed is an understatement, and yet I know that whatever happens is going to be alright. Hell, it’s going to be awesome. Today I’m working on finalizing the print outs for the last three new designs for my new release, my catalog, and printing (fingers crossed since my upper back has been fairly cranky lately). Tomorrow Sarah, Ja and I meet to exchange pre-show mailers and coordinate all the little bits and parts left to put into place. I also plan to burn screens, print, and do a bunch of other stuff I don’t want to think about right now. Saturday Mr. Mate and I will be borrowing the SUV and trailer of a very kind friend to haul the 4×4 ft wall panels down to Sarah’s studio. I’ve also got to print. Sunday I’ll be at the Fremont Market between 10 am and 5 pm so if you’re in Seattle swing on by stall 43 right in the middle of the market. I’ll have lots of great cards perfect to give to mom on Mother’s Day (May 13). Another perk of coming down to the market on Sunday is that Mobile Food Rodeo will be right next door with a gargantuan collection of 35 food trucks. Mmmmm. Monday our freight pickup is scheduled between 8 am and 5 pm and despite the fact that we’re planning to load the pallet that morning around 6 am (queue dark bags under my eyes and blurry brain), it’s one of the least stressful items on my plate. I’ll also need to send my catalog to the printer and of course, print. I’ll sign off here and start wading through the piles on my desk to get some semblance of organization and sanity in the studio. Oh and maybe I’ll eat some chocolate. I leave for the Stationery Show in exactly 3 weeks. And while I’m not quite in panic mode, I’m certainly shifting into high gear. One of the most important deadlines before actually leaving for the show is the freight pick up which will happen the week of May 6 and some of the most important things that will need to be freighted across the country will be the walls to our booth. Earlier this week Sarah and I painted the walls of the booth 1175 that we’ll be sharing with Ja from Ilee Papergoods. The panels looked beautiful in all their plywood grain beauty (no joke), but we’d already made the decision to paint the panels and jumped into the actual painting. It took us about five hours to put down two coats on 184 square feet of paneling, run to Lowe’s for more paint, and break at Whole Foods for coffee (dry time between coats was slow–I blame the drizzling rain). We chose grey walls. 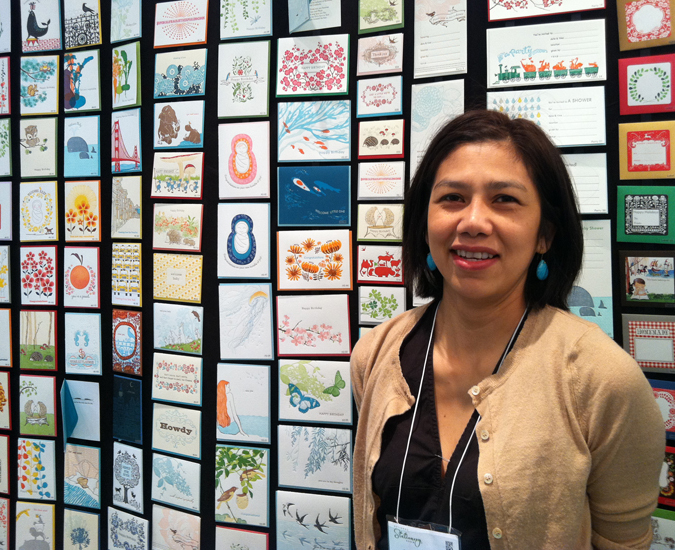 It’s certainly a well-used color at the Stationery Show, but for a good reason. It’s a neutral backdrop and when it’s a darker shade, it makes the cards pop. We toyed around with various color schemes since we all have different signature colors in our logos. In the end we decided that having a single neutral color would help our three-exhibitor booth feel more unified and less chaotic while allowing the actual products to shine. I’m really excited to see how everything comes together and set up works in real time. The days have been flying by here in the land of Orange Twist and sometimes I feel like I’m standing still while they do. In just about two months I’ll be debuting my line of cards at the National Stationery Show and lordy, the amount of work still to do! Certainly I’ve already done a lot in six weeks since paying my third of the booth fee for the NSS and have created the structure for all the other things I want to accomplish before arriving in New York. Lists are lame, but time is short, so here’s an abbreviated list of what’s been happening: I’ve researched, ordered, and received my new press. I’ve obtained a paper cutter. I’ve designed half my new collection and burned screens for a third of the new designs. I’ve enlisted an awesome designer to help me with my pulling my packaging together. I’ve increased the amount of drying space for printing thus increasing the amount of cards I can print at once. I’ve researched options for catalog printing. I’ve moved money around in order to pay for all this expansion. I’ve been keeping myself healthy by sticking to my stretching, walking, and icing schedule. Today I need to print and review and revise my timeline and prioritize all the things that need to get done. Sometimes that’s the hardest for me just because I figure if I do some of the less important things first all the REALLY important things will still need to be done and more will end up being finished. Probably a recipe for disaster but my recipe nonetheless. Since the beginning of January my gut was telling me that I had to do the show this year, but my bank account laughed and laughed. Online recaps and personal recaps of exhibitors led me to believe it will run anywhere from $6-10k for the actual booth, travel, and lodging. My own calculations put the number between to $6k and $8k if I exhibited by myself and had Mr. Mate along for support. By sharing two 6 x 10 foot booths and lodging with Sarah and Ja, costs should come down considerably. The National Stationery show will be an amazing opportunity for networking, generating new clients, and taking the leap to wholesaling Orange Twist cards to retailers around the country. I’m thrilled to be taking this step and hope you’ll check back in for updates! 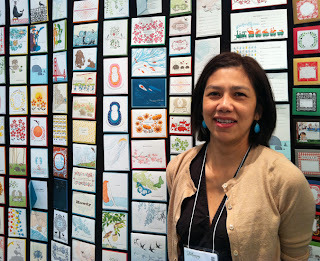 I was fortunate enough to experience the 2011 National Stationery Show (NSS) while helping out Ja from Ilee Papergoods. 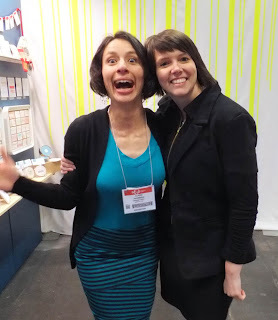 This was her fourth Stationery Show and I had a great time learning from her and attending the premier trade show for the stationery and greeting card industry. 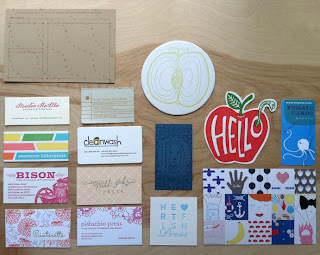 Ja began her business in 2001 doing calligraphy and custom letterpress invitations, but by 2009 had transitioned to creating ready-made letterpress cards. She works on a Chandler and Price press and includes up to 5(!) rich colors in each card. Since every color has to be printed separately, her cards are truly tiny works of art. Ja also puts out an amazing desk calendar each year which is letterpressed and screenprinted and a fantastic gift for yourself or favorite paper fanatic. Check out Ilee’s Etsy Shop for more info. 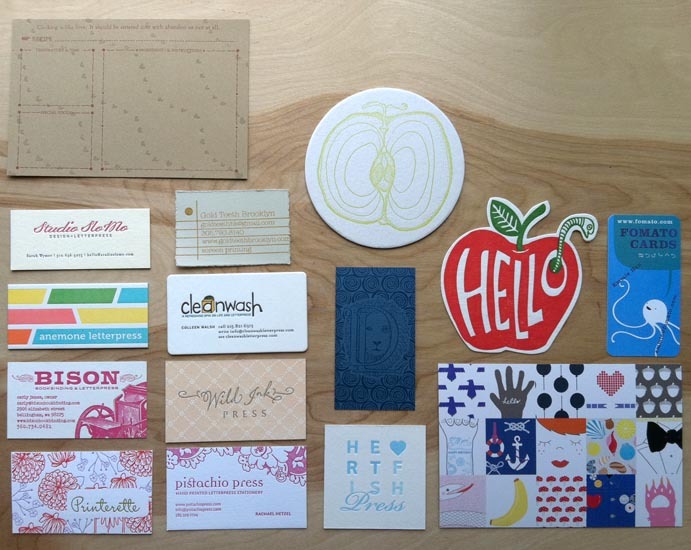 I met Ja earlier this year when Meredith MacLeod from Stubborn Twig Design introduced us during a studio visit. Meredith is an artist whose imagery is inspired by nature, textiles, color, and birds. Her original mixed media pieces are layered with paint, ink, and collage and created with handcarved stamps and non-toxic ink. Meredith and her cards can be found Saturdays at the Bayview Farmers Market on Whidbey Island or on Etsy. 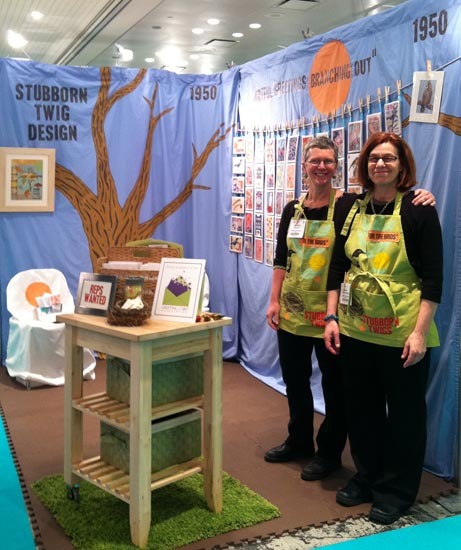 This was Meredith’s first Stationery Show and her friend Cathy of Little Packrats helped her out during the three and a half day show. 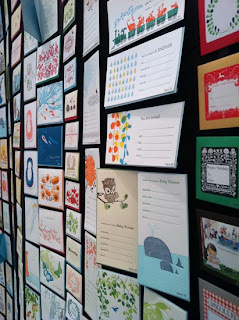 The NSS ran Sunday, May 15 through Wednesday, May 18 and though buyers and other exhibitors mentioned that the show was much smaller than in years past, I felt like there were a plethora of awesome, small, letterpress and screenprinted lines exhibited this year. While a wee bit intimidating and often overwhelming, it was fantastic to see the booths of card companies I love, and find new companies over which to drool! 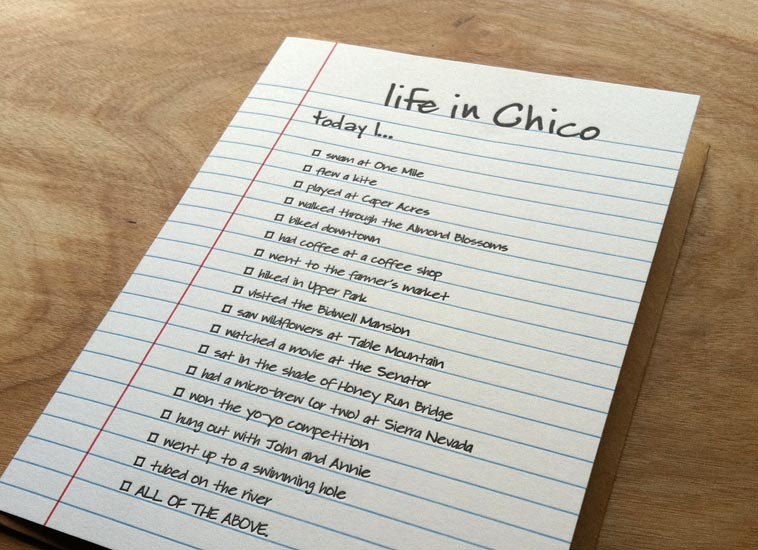 It pretty much sums up the fun stuff to do in Chico–use it as a guide! All in all I’m so glad I was able to go to New York and get an in depth experience at the Stationery Show. Many thanks to Ja and Meredith who made my trip possible AND worthwhile!